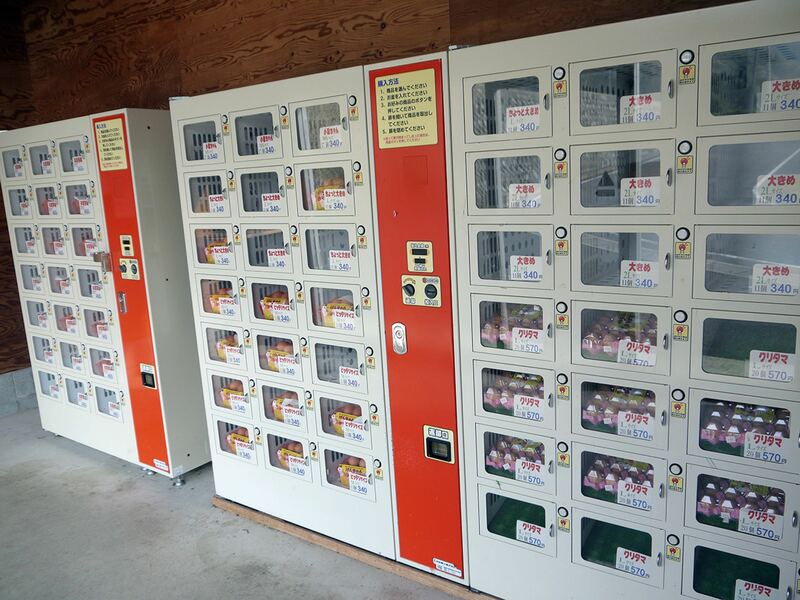 There are so many kinds of vending machines in Japan, but I never thought I would come across an egg vending machine. 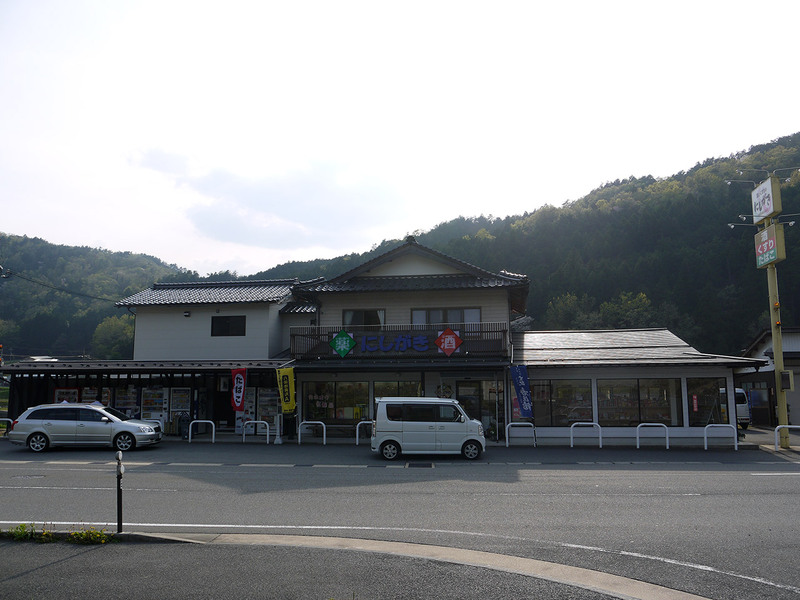 It is in the middle of the mountains in Northern Hyogo Prefecture. 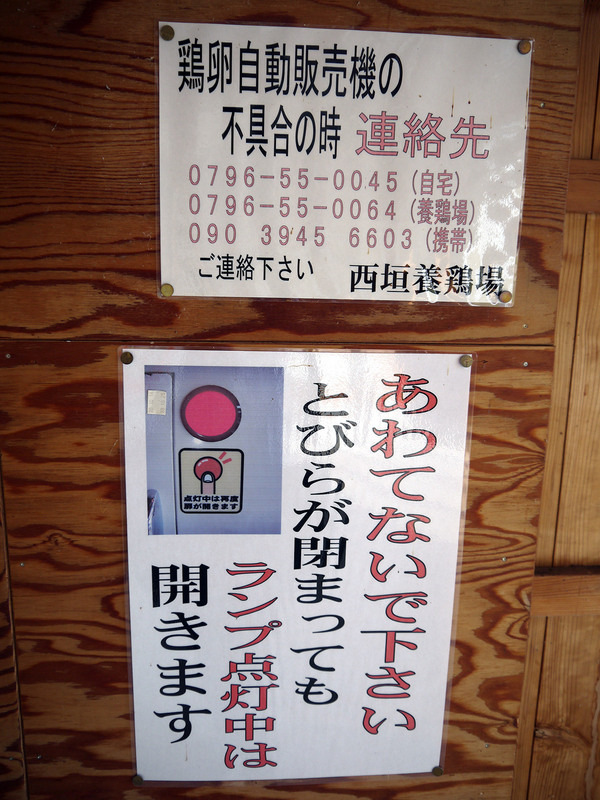 The sign above says umitateshinsentamago 生（う）みたて 新鮮卵（しんせんたまご）, which means fresh eggs that chickens just have produced. 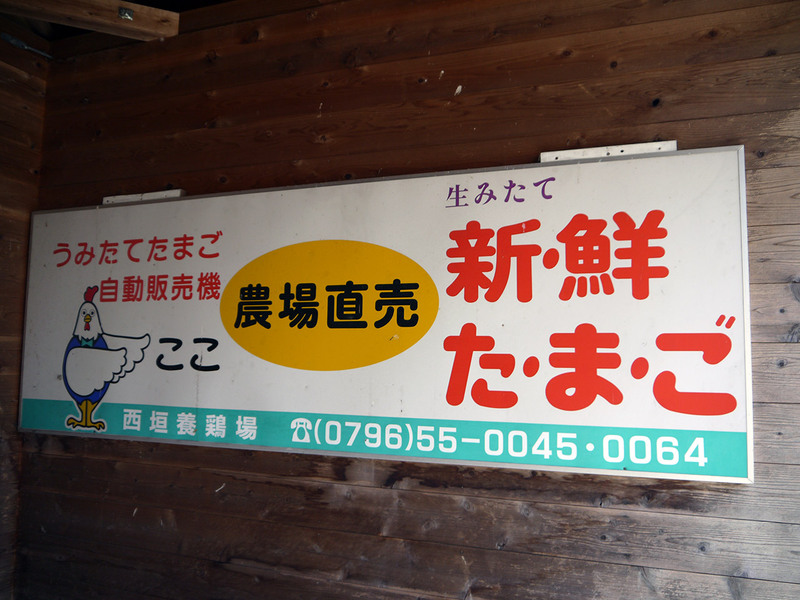 It also says nishigakiyōkeishi 西垣養鶏所（にしがきようけいしょ） (Nishigaki chicken farm) as a producer of the eggs. This sign hangs on the wall underneath the hut's awning. Inside were three machines containing 21 boxes each. It kind of looked like a locker room. Half of the boxes were empty. The price ranged was from 340 to 570 yen – my guess is that price is dependent on size / number of eggs. The first thing I thought upon entering the room was, "Wow! It's quite warm in here. Are the eggs okay? Are they refrigerated?" It turns out that fresh eggs don't really need to be refrigerated though so everything was okay. One thing I noticed was a sign that said: "Don't worry, the door will stay open as long as the lamp is on." I think a lot of people felt as though they needed to rush to remove their eggs before the door automatically closes. I wonder how many broken eggs it took before that sign was posted. Later that day I came across a pharmacy named Nishigaki, which is the same name as the chicken farm that owns the vending machine. I went in and asked if the owners were related. 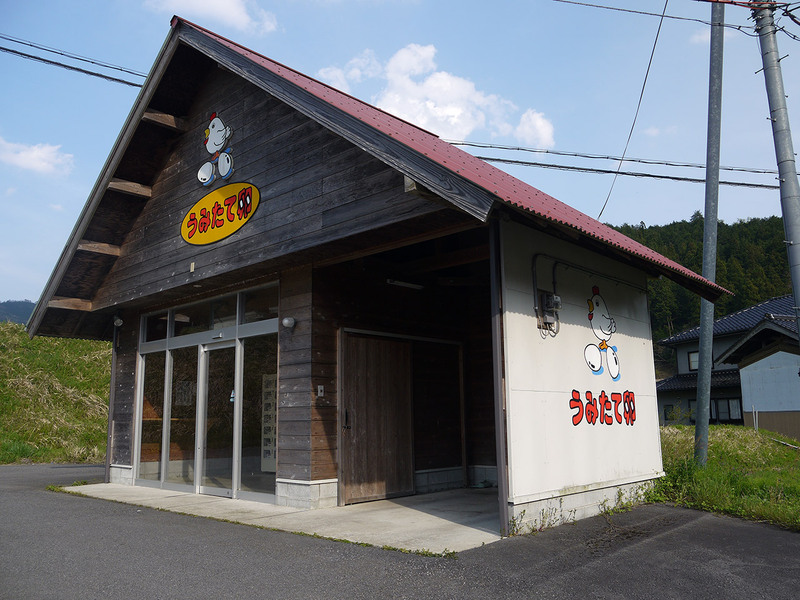 Sure enough, the owner of the chicken farm was the brother (or possibly brother in law, in Japanese they're both called oniisan) of the lady working there. Unfortunately, the owner wasn't there but she told me he may be in a nearby office next door to one particularly famous raw-egg-on-rice restaurant. Anyways, so I found out that the vending machines were indeed not refrigerated, but he does put an air conditioner on during the summer. She also told me that the eggs here were different from ordinary ones because they have a thicker shell. They last around two weeks at room temperature, so as long as it isn't especially hot, there's no problem not refrigerating these special eggs. I also found out that they are often sold out, especially on weekends, so it seems that it was rare that half of them were left. I guess I'm just lucky that way! One more unique thing about this egg vending machine (as if that's not unique enough! ): The hut is located right on the Japan Standard Time Meridian. 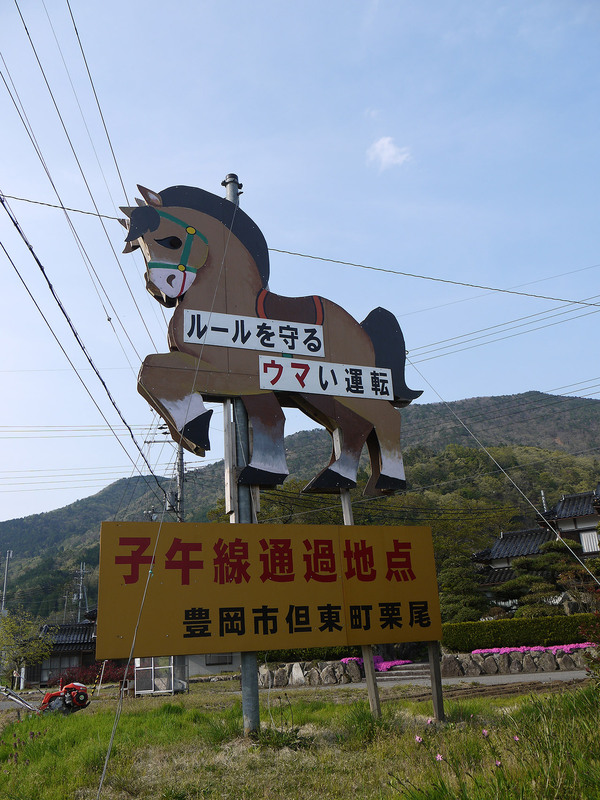 So, if you visit there you will be able to see the horse with the sign saying "shigosentsūkachiten 子午線通過地点（しごせんつうかちてん）子", which means that this is the point that the standard time meridian passes over. No need to come all the way here just to see a fresh egg vending machine, but I recommend the raw egg on rice restaurant that owns this place. It was one of the best raw egg on rice I’ve eaten. It was a long way out, but I want to eat it again. I know there are many unique vending machines in Japan, but I think these are the most unique. They eggs tasted great. Strong egg flavor. Yummy. The eggs lasted on the long car ride home. You must have a car. It's far out there.